Simply Weather is a free desktop weather application that helps to view current weather and weather forecasts for your location. It provides today’s temperature, wind speed, and humidity percentage on its interface and also lets you view weather forecasts for next three days. Once you have added your location (city name and country) and latitude & longitude, then you will be able to get most accurate results about weather forecast and today’s weather. All weather data is powered by forecast.io. Latitude and longitude values could be difficult to find, that’s why it helps to search these values online for your location from latlong.net. We have also covered 4 free weather desktop applications that are useful to find view weather reports right from system tray. 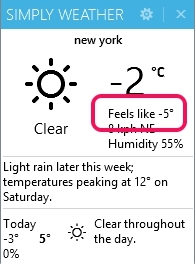 How To Use This Desktop Weather Application To Get Weather Details? Simply Weather is a lightweight weather application. Installation is also very simple but ad-supported. You have to use Decline button to skip installation of third-party tools. To download this software, you can use on the link available at the end in this review. When you open its interface, you need to add some details. These are: your present location, Latitude & Longitude, and API key. All these details are one-time entry only. 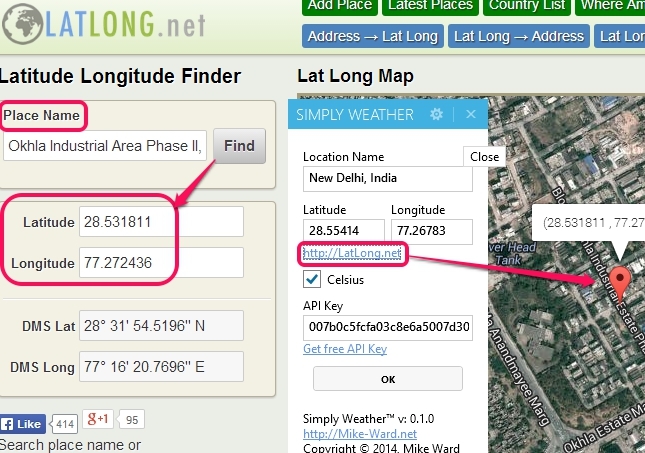 To find out latitude and longitude values of your location, use the link available on its interface, as highlighted in above screenshot. It will open a webpage on your default web browser. On that webpage, you can enter exact location to find correct values. Once these values are in front of you, add them at required place. And to get API key, use Get free API key option, and register with forecast.io. These are the mandatory details you need to fill. Fill these details and use OK button to save settings. Immediately weather details for today and weather forecasts for next three days will be visible to you. One of the simplest desktop weather application that provides today’s weather data and weather forecasts for next three days. If temperatures are extremely low or high, it will highlight them with Red color. However, I didn’t find any change, during my testing. Setup file is just 757 KB in size. So download will not take much of your precious time. You can change location whenever you want. Just use Settings icon and add another location. Simply Weather’s name suits it completely and is helpful to view weather reports in simple manner. However, only one location’s weather report can be seen at a time. If you are satisfied with your current location weather data, then Simply Weather can be useful for you. You may check these freeware to get weather for multiple locations together: Weather Station Warlock, Weather Beetle, and The Weather Network App.